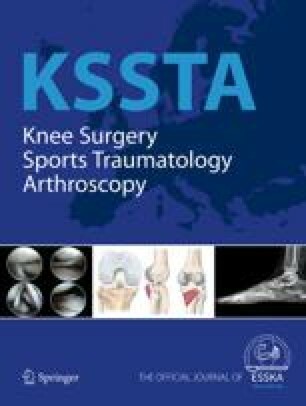 The objective of this study was to examine the gross changes after meniscal allograft transplantation with reference to the development of degenerative articular cartilage changes (DACC) and to examine the transplant behavior. The medial menisci of both knees in 32 Iceland sheep were operated on with either sham operation (C6), medial meniscectomy (M6), primary transplantation (P6), or secondary transplantation 3 months after meniscectomy (S6). These sheep were observed for 6 months. Another six sheep were observed for 3 months after meniscectomy (M3) and contralateral sham operation (C3). The DACC of the knee were visualized with an intra-articular toluidine blue injection. The dissemination area of DACC on the medial tibial plateau (MTP), the meniscal area, and the meniscus-free, exposed central area on the MTP were measured by computer image analysis based on digitized photos of the tibial plateau. These area measurements were calculated relative to the area of the MTP. The DACC in P6 knees had a mean of 4.3%, which was less than the 12.6% in M6 (P < 0.001) and the 16.1% in S6 (P < 0.001), but more pronounced than the 0.5% in C6 (P < 0.005). There were no detectable differences in DACC between M6, S6 and M3 (16.9%). The measurements of DACC were reproducible with correlation coefficient r = 0.97 on intra-tester test-retest measurements. The area of the free exposed MTP was larger in P6 and in S6 than in C6 (P < 0.001), demonstrating a displacement of the graft. S6 transplants showed shrinkage and were smaller than C6 menisci (P < 0.01). In conclusion, primary meniscal allograft transplantation reduced DACC within 6 months in sheep knees, but DACC were still present in transplanted knees. The meniscal transplants demonstrated peripheral displacement.